Turn left (N) on West Peachtree St. Turn right (E) on 11th St. In two blocks, turn left on Crescent Ave.
Or, stay straight on Crescent for 1100 Bldg. parking garage on the right just after crossing 12th St.
Or, for surface lots, turn left or right on 12th St. The 1100 Bldg is on the west side of Peachtree St., between 13th and 12th Streets. Surface lots are located on Peachtree St., directly across the street from the 1100Bldg., as well as on several other nearby streets. 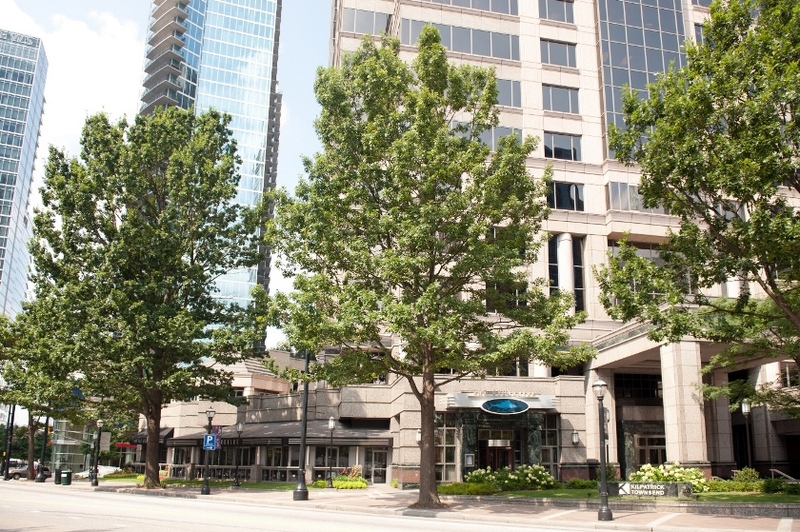 Valet parking in the 1100 Bldg garage is available at the front of the building on Peachtree St.
For on-street, metered parking, turn west on 12th St.. Parking spaces are located on one or both sides of 12th and other nearby streets. 1100 Bldg garage self-parking, entrance is on the opposite side of the building from Peachtree St.: Turn west on 12th St. from Peachtree; in one block, turn right on Crescent Ave. The self-parking entrance for the 1100 Bldg. garage is on Crescent, between 12th and13th Streets.